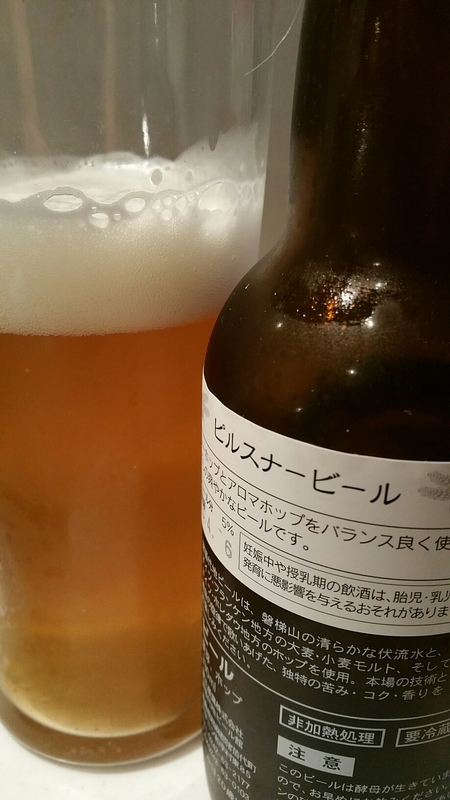 Inawashiro Pilsner is one of those beers that has the appellation “ji-beer” tagged onto it. If you haven’t had the fortune to read Joe’s soapbox on that, go and read it now on his review of Abashiri Jaga Draft for a more informed discussion on it and its downfalls of being tagged onto a beer. Inawashiro Pilsner has been brewed since 1997 and is a 5.5% award-winning pilsner, having won a couple of awards at the International Beer Competition in 2007 and 2008. Like other Inawashiro Ji-Beers, you need to look at the back to make sure you have the right beer. Rob didn’t have the best of luck with his Inawashiro Golden Angel beer and gave me a couple of bottles of the Inawashiro Ji-Beer range, including this Inawashiro Pilsner, to drink. I don’t know if he had a dodgy bottle or not, but the beer had a splendid golden colour to it with a good sized amount of frothy white head on top. There was a strong pilsner aroma coming off it with some hops and bitterness thrown in. Nothing that would be deemed overpowering, but if you’re used to drinking Kirin, Asahi, and other bland pilsners, Inawashiro Pilsner may come off as potent to you. If that’s you, well, stop complaining and drink some more craft beer pilsners and open your nose and mind. The bitterness from the hops played a role in the body of Inawashiro Pilsner, providing it with a short, sharp bitterness that hid a digestive flavour. Let’s not diverge too much, but those digestive biscuits are awesome when dunked in coffee. I haven’t tried them in a beer yet though. The strangest thing about Inawashiro Pilsner though was the creaminess that was present for some reason. It didn’t affect the beer too much though I don’t know if that was my taste buds going crazy or the beer? Inawashiro Pilsner’s creaminess aside, it is a nice, easy-drinking lager that is worth drinking when it is chilled down. Inawashiro Pilsner can be bought from the Inawashiro Ji-Beer online store here. I got my bottle from Rob who in turn got it from World Beer Market here.